The Boston Bruins are finally coming home tonight to face the Pittsburgh Penguins at the TD Garden in front of their loyal fans. They will be back on the road tomorrow as the schedule is quite busy: they face the Montreal Canadiens on Saturday and the Toronto Maple Leafs on Monday. Lineup changes were made today in time for tonight's tilt agains the Penguins. Young forward Jakob Forsbacka Karlsson has been promoted to top-line duty and will centre Brad Marchand and David Pastrnak against the Pens. "Two amazing players...it's an incredible opportunity for me, it's gonna be a lot of fun to play with those guys," said the rookie player after the morning skate. Forsbacka Karlsson had played the majority of his first six games this season as the third-line center, but a brief spin with Marchand and Jake DeBrusk against the Detroit Red Wings on Wednesday led to his second goal. Head coach Bruce Cassidy trusts him with his new duties. "He had his hands full with where he was and he's responded well," said Cassidy. "Today we're gonna move him up. Part of that is we're at home, we can control the matchup a little bit. He might get a great one because there's not too many weaknesses on the other team. "But it's also [that] his response was very good when we moved him up in Detroit, played harder - literally broke two or three teeth but kept on playing." More changes are also coming to the blue line. After missing the last two games with a lower-body injury, defenseman John Moore will return to the lineup. 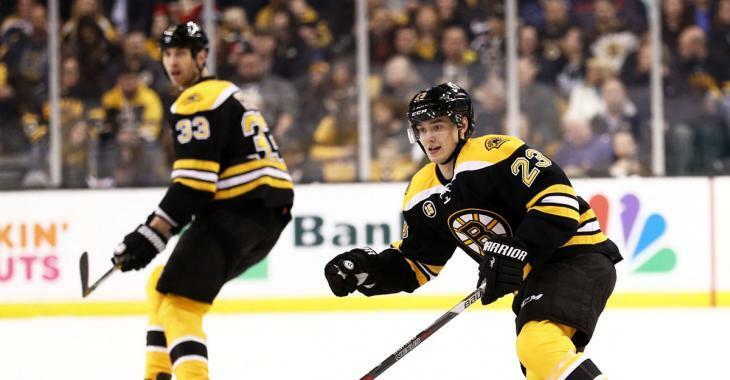 The blue line has been ravaged by injuries and unfortunately, defensemen Charlie McAvoy, Urho Vaakanainen, and Brandon Carlo are not expected to play on the upcoming trip to Montreal and Toronto. They all skated before the full group on Friday morning, but need more recovery time. Jaroslav Halak gets the start in goal, with Tuukka Rask starting on Saturday night in Montreal. Scratches: Anders Bjork and Steven Kampfer.